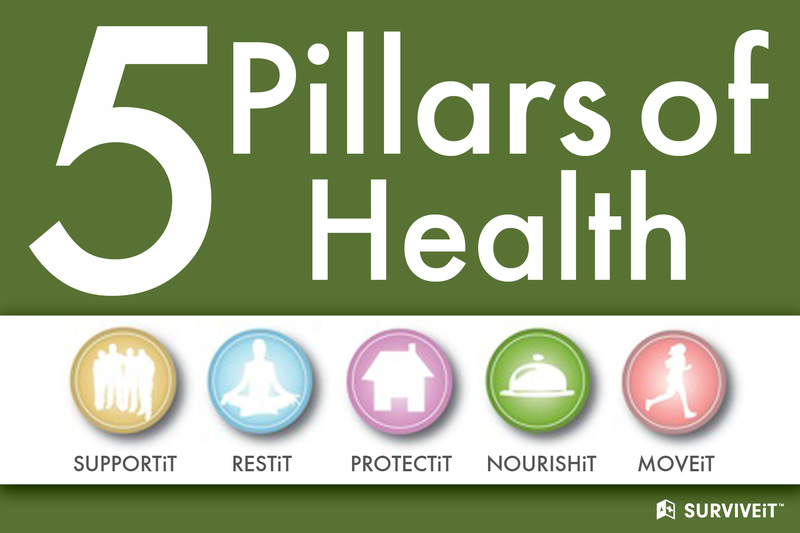 SURVIVEiT’s Five Pillars of Health are based upon our belief that there are five equal and essential components to complete wellness. When one of the pillars is missing, your body and mind cannot operate or heal at their full potential. Especially when facing illness, it is essential to keep these five pillars in mind as you work to reach your ultimate state of well-being. MOVEiT: Physical fitness empowers you. Strength and confidence carry into all areas of your life. Not only has exercise been proven to reduce your risk of cancer and other diseases, but physical activity can also aid in your body’s healing process. RESTiT: When you deprive your body of the necessary sleep it needs, or when you lead a life of chaos and stress, your body will suffer and you could be at a greater risk of getting sick. Maintaining a sense of calm is key to achieving total well-being. SUPPORTiT: Living a balanced and healthy life means loving life. You must learn to love yourself, take responsibility for yourself, set meaningful goals, and treat your body with care. A strong sense of community and faith are two ways you can support your journey to health. PROTECTiT: Environmental toxins are everywhere and, if you’re not careful, they can sabotage your wellness. With SURVIVEiT’s help, you can start to identify the hazards around you and minimize your health risks.